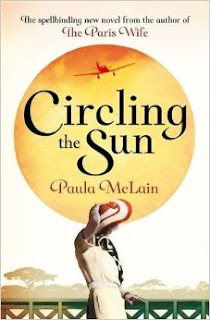 Having read and enjoyed The Paris Wife, I was excited to see that Paula McLain had another book coming out this August. Like in her previous novel, McLain explores the real life story of a woman in history, this time taking on the remarkable Beryl Markham and her life in Kenya's ex-pat community during the 1920s. With her trademark vivid, sensual style McLain leads us through Beryl's early years growing up under the care of her father following her mother's departure from their lives, her love of all things wild and her shunning of the conventions forced upon women. When her father must sell the farm, she is left with a difficult choice, ultimately finding herself in a marriage which becomes increasingly unhappy. Determined not to let this prevent her from living a life she can love, Beryl takes it upon herself to become the first female horse trainer. McLain captivates with her writing as Beryl develops from a somewhat naive girl into a fiercely independent woman who is unafraid to pursue her desires, even at the risk of damaging her reputation. She moves in bohemian circles and falls hopelessly for Denys Finch Hatton who is involved with the writer Karen Blixen (author of Out of Africa). This relationship is to shape the course of her life and ultimately lead her to become the first woman to fly solo across the Atlantic from east to west. The first person narrative makes this story utterly absorbing; the character McLain creates is intensely likeable and compelling to read about. Beryl's adventurous spirit and thirst for life make the story energetic and the author creates a real sense of what it was like to live in Africa at that time. I thoroughly enjoyed this novel and would definitely recommend it. Thanks to the publishers for providing an advanced copy via Netgalley.